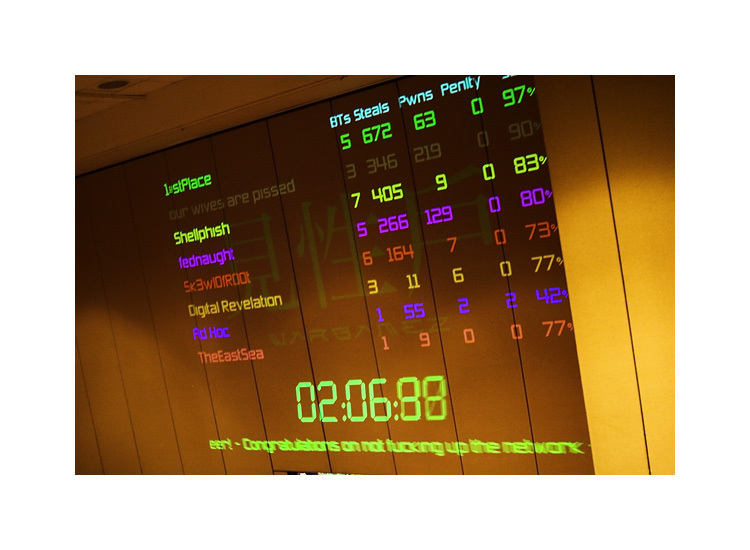 This year, Kenshoto hosted the 2006 DefCon Capture-the-Flag Contest, starting August 4th. Check back here for a possible write-up. CTF is much larger than the prequals, so it may take some time (and masochistic tendencies) to do a detailed walk-through of the entire contest. C|Net - OMGPONIES, nopsr.us is getting a lot of traffic now. AP - who is the "unmentionable" team name? "Our wives are pissed"? That's silly. Keep services up at all times. Who cares if someone is stealing your keys?! Service Level is a direct multiplier of all other points. Automate attacks. Spend your time developing new attacks, not running old ones. Automate key management. Spend your time stealing new keys, not shuffling old keys. Mr. Kenshoto has a great crew. They rocked. Having to submit keys over DTMF is just plain mean. Cool... but very mean.